The majority of this week has been spent in my small Ohio hometown, where I've enjoyed running on the National Road Bikeway. I discovered that our high school track has been beautifully redone, and I'll be heading that direction for a speed workout tomorrow. I'm actually looking forward to a speed workout! Here's a look at this past week. I needed to push myself a bit, so after 2 easy miles I decided I'd done a good warm up for a hill workout. I ran 5x hill repeats on the Vista Slope by our office in Mountain View, then another mile or so cool down. I pushed the pace on the hills and felt great. Rest, traveling all day to get to Ohio. Left the house at 7:30 am Pacific, arrived at my parent's house at 11:30 pm Eastern. Long day, delayed flight, almost missed connection, and no luggage. Luckily Delta is awesome and delivered the luggage to me (even an hour away from the airport) so I had it by the time I woke up. I also flew first class thanks to a status upgrade, so I was in good spirits! This is the full out and back distance of the National Road Bikeway. I was worried about the crazy heat Ohio had been having, but it cooled down and ended up being a nice run other than some humidity. I really do love this trail. More on the National Road Bikeway in my home for Christmas post. My mom, dad, and I headed to the bike trail for some exercise, and it was great to get them out there. 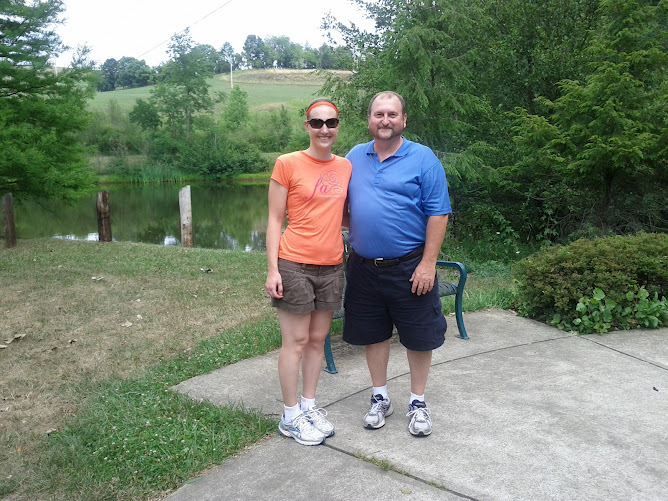 If you are reading this mom and dad - you should walk on the trail more often and enjoy the great outdoors! Again, I ran on the bike trail. There aren't many other good options here that don't involve roads without sidewalks, so I stayed here for safety. I ran the length of the trail four times to get the distance. By this point of being in Ohio my allergies were bothering me a lot, so breathing was feeling tough after a few miles. 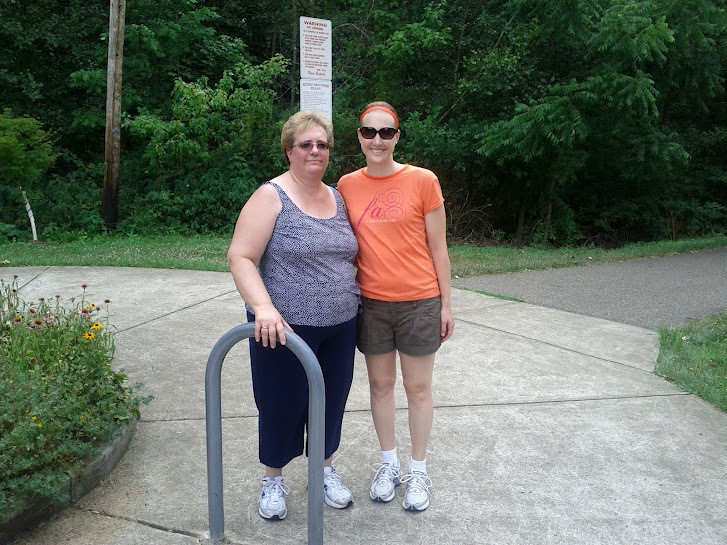 Overall I kept a decent pace and enjoyed the trail scenery. Friday evening I headed to Pittsburgh with college friends for a girls weekend, and we had a blast! Saturday we walked around Station Square, took the Ducky Boat tour, relaxed in the room, and had dinner with a view at the top of Mt. Washington. I had full intentions to run on the trail by the river this day, but I was having too much fun being with the ladies I never see and didn't want to leave them! At times like this, friends really do need to be the priority. I was so sad to leave them after a fun weekend! I have a couple more days with my parents, and then I head back to San Jose. Had to come by from twitter to check out Track Champion Barbie, how neat is that! Love your blog. Ha..didn't know you went to school in PGH. I went to CMU for grad and my project partner went to Pitt. Have vest, headlamp and tail flasher for the Ragnar! Went to school in Ohio actually, but we met in Pittsburgh for the weekend! My parents live about an hour from Pittsburgh. Ha! 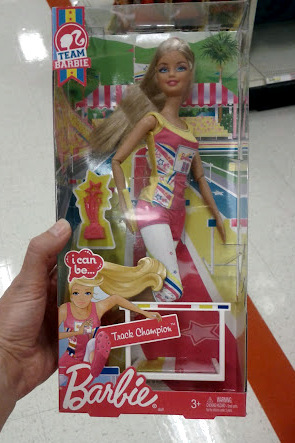 I love track champion Barbie. If I had a thing for Barbie, I'd probably tell my hubs that he had to buy it for me to give to me at the finish line of a race. Are you on the far right in that picture of girls? Those glasses are fantastic!! !